A stowaway plunged to his death from a British Airways plane onto an office block near Richmond. Another stowaway survived the trip and receiving hospital treatment. The plane was a 747 on an 11 hour flight from Johannesburg. The spot where the man fell was just a few hundred metres from Kew Gardens. Around three quarters of plane stowaways are killed by the cold or the landing gear during flights. Earlier this year a coroner’s court heard how a Turkish man froze to death in July 2013 when he climbed into the undercariage of a BA jet from Istanbul to Heathrow. In September 2012, a stowaway from Mozambique fell to the ground in a suburban street in Mortlake. A Pakistani stow away who fell from a plane, presumably as the undercarriage came down, over Richmond in July 2001. Data from 2012 indicated that since records began in 1947, 96 wheel well stowaways are thought to have attempted to board 85 flights. Of those 73 of those stowaways died and 23 survived. More information about objects falling from planes, below. A stowaway plunged to his death from a plane and landed on offices in a west London high street – while another is in hospital after surviving the flight. The two men are believed to have climbed into the wheel compartment of a British Airways 747 plane before it flew more than 8,000 miles from Johannesburg in South Africa to Heathrow. The victim fell on to the HQ of the online gift company NotOnTheHighStreet.com in Richmond yesterday morning as the plane approached the airport. The second man – aged between 25 to 30 – was found unconscious after the plane landed at Heathrow after the airliner’s 11-hour overnight flight to London. He was taken to hospital where his condition is described as serious but stable. Ellie Roberts, 22, who works in the nearby Orange Tree pub, said: “We are all shocked by this, what a terrible death. The spot where the man fell was just a few hundred metres from Kew Gardens. Experts said cases of stowaways surviving long plane journeys at high altitude are very rare. Around three quarters of plane stowaways are killed by the cold or the landing gear during flights. Earlier this year a coroner’s court heard how a Turkish man froze to death when he climbed into the undercariage of a BA jet from Istanbul to Heathrow. His body, dressed in thick clothes and with socks on his hands, was found by ground crew at Heathrow in July 2013. A pathologist found he had survived most of the journey, but died before he fell to the ground. Scotland Yard said they were trying to establish the identity of the two men – and establish that they were on the same plane. A spokesman said the body was found on the roof of premises in Kew Road at 9.35am yesterday. He said officers were called to Heathrow at 8.28am to reports of a suspected stowaway on a flight from Johannesburg to Heathrow. Kew ice block fall – 7th February 2018. People living under flight paths not infrequently suffer from objects that fall from planes, the most common of which appears to be lumps of ice. Now (on 4th March) there has been yet another incident where a block of ice has landed on a house, narrowly missing people. The house is under a Stansted flight path, in Chelmsford, Essex and is the home of a couple and their two teenage children. The ice block, described as perhaps football size, crashed through the overhang of their roof, missing going through the bedroom ceiling by just a few feet. That part of the bedroom is where the couple sleep. The ice block left a gaping hole in the roof. Members of the family were asleep at the time, and were woken by a noise they thought was a bomb going off. The couple now face a repair bill of thousands of pounds. Had the block been only a few inches closer to the window, the couple fear it would have impacted the window, which would have shattered it – with the bed just feet away. The CAA have been contacted, to ascertain if the ice is indeed from a plane. Ice can form naturally on aircraft flying at high altitudes which falls when the plane descends into warmer air and the ice breaks away. The CAA says it is not liable for damage due to an ice fall. Other incidents of objects, including ice, falling from planes. An elderly couple, in Twyford, Berkshire (under a Heathrow flight path) had the unpleasant experience of a block of ice, which appeared to have fallen from a passing plane, crash through their roof. The two foot long block cracked the ceiling. Luckily it hit the roof in a different part of the house from where the couple were. They said they were lucky not to have been injured. There have been many other incidents over the years of blocks of ice falling – associated with frozen water from aircraft lavatories. Had the ice block fallen onto the road, it could have hit a car or a passer-by. Had it fallen onto a busy road like a motorway, it could have caused a serious accident. The elderly couple had to be assisted by their son in sorting out insurance, and getting the roof repaired. As the insurance company was slow, being a Sunday morning, the local fire brigade helped to patch up the damage and confirm the water and electricity supplies to their house were undamaged. Water (from a lavatory?) from the ice block was dripping through the (now sagging) damaged ceiling. The couple have kept a sample of water, so it can be tested, to identify if it is from a lavatory. Other reports of earlier incidents of items falling from planes can be seen here. In July 2014, a 2 ft diameter piece of metal fell from a plane overhead, into the pool of a popular water park. Luckily it was early, before the water park opened. The metal piece came off an ExpressJet Embraer 145 XR taking off from Chicago O’Hare for Arkansas. Unknown to the pilots, the bolts on a piece of exterior equipment called a diffuser or a mixer were not securely fastened. The diffuser bounced off a play structure and plunging into an unoccupied children’s splash pool. Nobody was hurt. The diffuser, a round, wavy steel piece, mixes hot air from the engine exhaust system with air pulled in by the fans. Weighing from 5 to 10 pounds, the part was attached with 8 bolts. However, the bolts were probably not secured properly. Investigations led to more findings of loose mixers and caused ExpressJet to step up inspections, and experts say these incidents are “extremely rare.” The jet had been inspected in June 26, 2014, but the check didn’t include the mixer. Neither engine manufacturer Rolls-Royce nor ExpressJet had any comment. List of some other items that have fallen from aircraft here. A Thomas Cook Boeing 757-300 that took off from Gatwick on 31st October 2014 dropped an emergency escape chute [about 25 kg weight?] as it approached Gatwick, for an emergency unscheduled landing. The plane’s escape slide fell off at 3,000 ft as it was approaching the airport, and was later found stuck in a tree (location not specified). A report by the AAIB said several minor issues combined to loosen the slide release mechanism of the slide as the plane was taking off. A crank handle had not been in the right place. During the take off the cockpit instruments showed that the right over-wing escape slide container was not secure. With no sign that the slide had actually come loose, the crew continued with their take-off. The pilot circled around for 40 minutes, with landing gear, flaps and airbrakes deployed to burn off excess fuel and get the plane down to a normal landing weight before returning to Gatwick. As the plane descended to 3,000 ft, some of the cabin crew and passengers heard a number of bangs or felt the airframe shuddering. Two passengers reported seeing a white object falling from the right hand side of the aircraft. It was later discovered that the emergency slide had struck the body of the plane and one window before it fell. A retired couple were left with a hole in their roof after a chunk of frozen poo fell from a passing plane. Keith Mead, 70, and his wife Ruth, 67, heard a loud bang. He rushed outside thinking there had been a car accident. But the couple were astonished when they saw a hole in their roof and found the seven-inch long chunk of ice on the lawn. The lump of frozen urine and faeces had fallen from a jet about 30,000ft overhead after being flushed from a toilet on the plane, they claim. 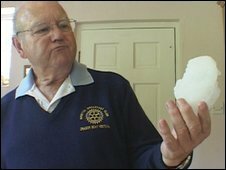 Mr Mead, from Melksham, Wiltshire, bagged up the ice ball and put it in his freezer to show insurance assessors who visited that day. It was just as if someone had crashed into our house. I looked up and there was a gaping hole where a large lump of ice had impacted the roof. Around 25 ice falls in the UK are reported to the Civil Aviation Authority each year. A block of ice believed to have fallen from an aeroplane crashed through the roof of an Essex cathedral during a Sunday service. 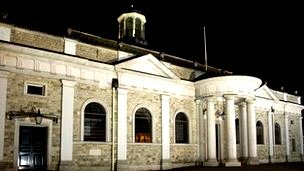 Father James MacKay was leading the Eucharistic prayer at Brentwood Cathedral when he heard an “explosion”. The congregation looked on as a shower of roof slate and ice fell outside the building. The cathedral’s roof and beams were damaged. The Civil Aviation Authority (CAA) said ice strikes from planes were rare. Fr MacKay said: “Halfway through the celebration there was what sounded like a massive explosion to the left side of the cathedral. “Everything stopped as we heard this. I turned to my left to see lots of slate and what looked like white stuff, which we now know was ice, falling from the roof. “I was trembling with a bit of shock. An usher who went to investigate told Fr MacKay the cathedral had been hit from above, possibly by ice from a plane. The CAA gets about 30 reports each year of ice falling from aircraft. A CAA spokesman said: “Ice falling from planes does not happen that often – it can happen around hose connections and if washers fail. “You can have a big lump of ice come off an aircraft as it descends into warmer air. The building, near the High Street, is England’s newest cathedral and was built between 1989 and 1991. The damage caused on 1 July has been repaired and cost hundreds of pounds, the cathedral said. In a freak accident a man in Bristol has been hit by a lump of ice falling from a plane. What happens to the ice that forms on aircraft? It is the stuff of a spoof news report – an injury sustained from ice hurtling to earth after breaking off a plane. Bristol pensioner David Gammon is badly bruised after a grapefruit-sized ice block fell from the sky and into his lap. He was in his garden, under the flight path of Bristol International airport. The airport has found no proof the ice came from any of its planes, and its air traffic controllers calculate it could have fallen from another plane flying within a five mile radius. In such incidents, the ice typically forms from water leaking from the aircraft, says Richard Taylor, of the Civil Aviation Authority. Unlike in The Day Today sketch where a woman is lanced by a falling urine icicle, toilet waste is not always to blame. “The misconception is that a toilet has been flushed and the remnants, when falling to earth, have frozen,” says Mr Taylor. Hence the name “blue ice”, so called for the chemicals added to plane toilets to mask odour and break down solids. According to the Federal Aviation Administration, modern commercial aircraft cruise at high altitudes, and the sub-zero temperatures outside cause any liquid to freeze immediately. The resulting ice then breaks off the plane, gaining speed as it falls to the ground far below. Most ice will break up on descent, says Mr Taylor. And for a person to be hit is extremely rare. Out of three million flights in the UK in the past year, there were just 35 reported cases of ice falling. And in the 40 years the CAA has been recording such incidents, there have been just five cases of a person being hit. “That really puts this circumstance into perspective,” says Mr Taylor. But there have been numerous reports of cars or buildings being damaged by falling ice. In 2003 Chris Hastings was awakened by a large crash. He emerged from his house in Manitoba, Canada, to find a basketball-sized chunk of yellowish ice on the roof of his blue estate car. And two years ago in California, an ice boulder punched a hole through the wall of a recreation centre, and shattered into fragments said to be as large as bowling balls. The local airport said the ice may have fallen from planes flying overhead. A pensioner had a miracle escape after a block of ice smashed through his car windscreen and landed on the driver’s seat. 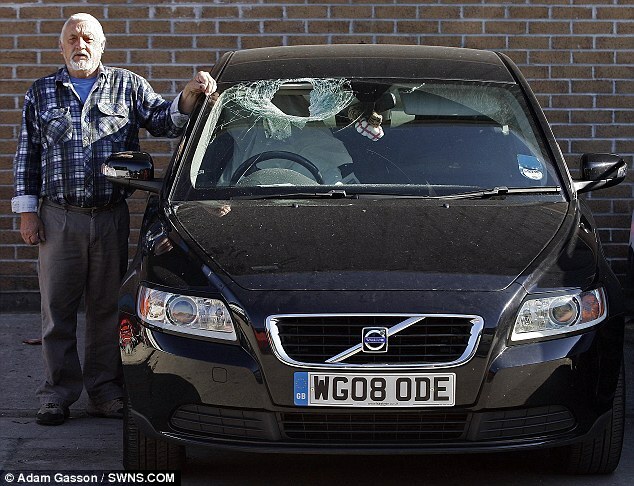 Kenneth Hendy, 71, had just got out of his Volvo when he heard an enormous crash. The father-of -seven rushed back to discover a block of ice the size of a rugby ball had landed where he had been sitting just seconds before. The ice is thought to have fallen from a passing aircraft before landing on the car outside his home in Plymouth, Devon. A basketball-sized chunk of ice crashed through the roof of a family’s Colorado home after apparently falling from an airplane passing overhead. Danelle Hagan and her 9-year-old daughter were at home in Brush on Saturday when they heard the kitchen ceiling come crashing down. They were not injured. FAA spokesman Mike Fergus said Wednesday the ice chunk appears to be “Rime ice,” which can build up on the outside of a plane’s fuselage when it flies through cold and wet air. Fergus says that it doesn’t appear the ice was “blue ice,” which comes from an airplane’s toilet. After investigators determine whether the ice came from a plane, Fergus said they’ll look at which planes are in the area at the time to see if it’s possible to tell which craft dropped the ice. Fergus said that in cases of falling blue ice, FAA investigators would inspect any plane that was in the area to make sure it doesn’t have a dangerous pressure leak. He said that ice falls from airplanes are alarming, but extremely rare. Hagan’s family is staying out of the house until it’s repaired because the crash loosened some asbestos. She says people were in the kitchen just before the ice fell, so they’re just glad to be OK.
“If we had been in that kitchen, it would have been devastating,” Hagan said. to work when the 20kg (44 lb) lump of frozen toilet waste fell from the sky. Now we hear that a shed in Sutton has been obliterated by a block of ice that fell from a passing airplane’s leaky toilet. scene were quickly dismissed as the “wild-eyed stories of a delusional Londonista”. on, said it would be impossible to tell from which passing jet the block fell. drops from fuselages when planes descend into warmer air”. So now you know. and the contents go to the local sewage works. From Wikipedia Blue ice in the context of aviation is the frozen sewage material dispensed mid-flight from commercial aircraft lavatory waste tanks, a biowaste mixture of human waste and liquid disinfectant that freezes at high altitude. The name comes from the blue color of the disinfectant. Airlines are not allowed to dump their waste tanks in mid-flight, and pilots have no mechanism by which to do so; however, leaks can occur. There have been cases of people falling from planes over London. presumably as the undercarriage came down, over Richmond in July 2001.
probably hoped he would one day raise a family. he says, is a terrible thing. lowered the wheels; the young man was tipped out into the early morning sky. Neighbours have described the horrific moment when a man’s body, believed to be a stowaway from a landing aircraft, was found in an East Sheen street. Annie Williams who lives in the house where the body was found said she heard a loud noise when she was opening her curtains. The 47-year-old said there were remains on her car and doorstep, which were later cleaned by a council worker. Neighbours said the body was lying in between two cars outside numbers 18 and 20 in Portman Avenue. Dawn Taylor, 83, said she heard a noise and thought it was something inside her house, until her husband went outside and saw the police. She said: “We thought it was a bump in the house and thought we would discover something had fallen off a shelf, it wasn’t loud enough to worry us. Her husband, John Taylor said he spoke to neighbours about the incident. The death is currently being treated as unexplained and a post-mortem examination was due to take place this week. Richard Taylor from the Civil Aviation Authority said this kind of incident was not unheard of and added there was very little chance of survival for stowaways. In 2001, a man fell from a British Airways Boeing 777 which was heading towards Heathrow and landed in a Homebase car park in Richmond. On August 24 this year a stowaway was found dead inside a British Airways jumbo jet at Heathrow after a man climbed into the plane at Cape Town. Mr Taylor said stowaways were sometimes crushed by the mechanisms in the plane. The flight path over Portman Avenue where the body was found, around 10 miles from Heathrow, is where the planes prepare to land. A man was found dead last month in the landing gear of a BA jet from Cape Town to Heathrow. The body of a Pakistani stowaway, believed to have fallen from a plane, was found in a car park in Richmond, South West London, in 2001. A month later another suspected Heathrow stowaway plunged to his death near a New York restaurant after sneaking aboard a US-bound flight. Incredibly, a 20-year-old Romanian man SURVIVED temperatures of -41°C after hiding inside the landing gear of a Boeing 747 from Vienna to Heathrow in 2010. It is not the first incident of this kind on the Heathrow flightpath. In 2001, the body of Mohammed Ayaz, a 21-year-old Pakistani, was found in the car park of a branch of Homebase in nearby Richmond. Four years prior to that, another hidden passenger fell from the undercarriage of a plane on to a gasworks close to the store. Others turned up at Heathrow itself. On 24 August, just 16 days before the discovery on Portman Ave, the remains of another man were found in the landing gear bay of a Boeing 747 after it touched down from a 6,000-mile flight from Cape Town. The bodies of two boys, thought to be as young as 12, were discovered in the undercarriage of a Ghana Airways flight from Accra in 2002. POLICE were last night trying to reconstruct the final moments of two aircraft stowaways who fell to their deaths from the undercarriages of passenger jets. The first, a man in his twenties, was found by farm workers on Christmas Eve in the middle of an 80-acre field at Rudgwick, on the West Sussex-Surrey border. The man’s injuries and the location of the field, directly beneath the main flight path into Gatwick and Heathrow airports, suggested that he had fallen to his death as an aircraft lowered its undercarriage in preparation to land. At 9.30am yesterday, a man fell from the undercarriage of a British Airways Boeing 777 as it took off from Gatwick, bound for Mexico. Any connection between the incidents was ruled out. Police said the first body might have been in the field at Broadstone Farm for several days. A spokesman said: “The man was of Mediterranean appearance and was thought to have been a stowaway aboard a plane flying into Gatwick. Posted: Friday, June 19th, 2015. Filed in General News, Recent News.